Grab a Day Pass and enjoy the weekend. There’s so much Metro accessible stuff going on this weekend it’s a wonder anyone thinks they need a car to have fun in L.A. Friday and Saturday are chock full of events, from concerts to pre-Oscars screenings and discussions. 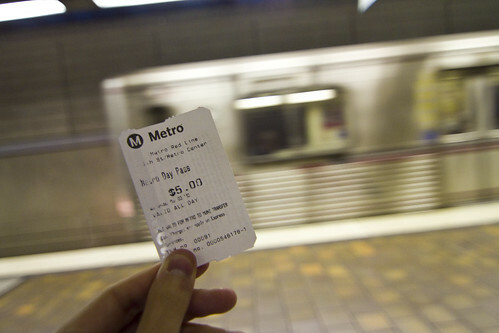 Plus, don’t forget to make time on Saturday or Sunday to take one of Metro’s FREE art tours of the system, put on by the Metro Art Docent Council. Have an event you’d like us to include? Shoot us an email at thesource@metro.net. Time and space constraints limit us from listing every accessible event in this city, but this curated list represents what we think is cool and easy to get to. Deer Tick starts their U.S. tour at the Natural History Museum following a discussion about flies. That’s right. Flies. When: 5:30 p.m.- 10:00 p.m.
IDA’s annual screening of the year’s best documentary films, Oscar nominated shorts and features and Independent Spirit Award winners. Where: Writers Guild of America Theater, 135 S. Doheny Dr.
Live Los Angeles based Jazz musicians put on a free show. Where: Angels Piano Bar, 2460 Wilshire Blvd. Poetry, violin and wine come together in Old Town Pasadena. Where: The Majestical Roof, 88 N. Fair Oaks Ave.
Watch all the Oscar nominated shorts in the animation and live-action categories. When: 7:00 p.m., 10:00 p.m. The rest of the weekend’s Metro accessible events after the jump. A mini-music festival featuring The Submarines, Pity Party, Summer Darling, and The Growlers. Metalcore show at The Wiltern. Oscar nominated film editors discuss their craft. Oscar nominated art directors discuss their craft. Watch high school students duke it out Glee style. Where: Long Beach Terrace Theater, 300 E. Ocean Blvd. Celebrate the Chinese New Year with a festival of lanterns, dance performances, arts and a parade. When: 12:00 p.m.- 7:00 p.m.